Paul McGinley is a professional golfer. McGinley had a bright future ahead of him as a Gaelic Footballer, until a broken knee cap ended his career at the age of 19. After entering amateur championships, Paul was selected for the 1991 Britain and Ireland Walker Cup team. He later turned professional joining the European Tour a year later in 1992, aged 25. In 1996, McGinley won his first title on the European Tour at the 1996 Hohe Brucke Open, and in 1997 he won the World Cup of Golf for Ireland with Padraig Harrington. He has also been on winning teams for the Seve Trophy, World Cup and the Royal Trophy. In 2009 and 2011 laul led the Britain and Ireland team to victory as captain in the Vivendi Trophy. However, it’s his Ryder Cup appearances that have cemented his presence as one of Britain’s best golfers. Paul achieved his place in golfing folklore by holing the winning putt on his Ryder Cup debut in 2002. He went on to represent Europe in 2004 and 2006, making him the first European Golfer to be a winner in every one of his three appearances. McGinley is passionate about the team format, a point that was recognised by Colin Montgomerie who named him as one of his Vice Captains for The Ryder Cup at The Celtic Manor Resort. Whether it is The Ryder Cup, Seve Trophy, World Cup or Royal Trophy, he has been on a winning team for all of them. In 2013 he was named as the Europe team captain for the 2014 Ryder Cup, becoming the first Irishman to captain the side. 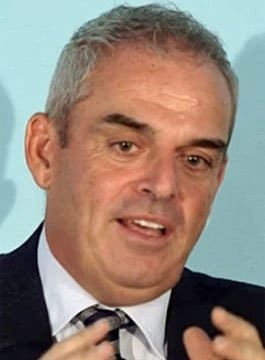 Paul McGinley is available for after dinner and keynote speeches.